Bird’s Nest (燕窩) was once considered a superior delicacy served only to the royal family and wealthy merchants. This salivary secretion of Swiftlets is especially useful in maintaining youth and enhancing wrinkle-free complexion. It’s considered a superior tonic for woman. Besides stimulating appetite and helping in digestion, Bird’s Nest also provides a unique form of protein and nutrients that helps speed up recovery from chronic illness. I’ve been taking Bird’s Nest since young and more during my flying days and when I was pregnant. Pregnant women are encouraged to take this premium delicacy because it’s believed that their babies will have beautiful, glowing complexion. However, these prized nests don’t come cheap. I got these from Eu Yang San, a reputable TCM shop in S’pore. Just 4 pieces of this cost a whopping S$340! However, these gems are especially great for special occasions. 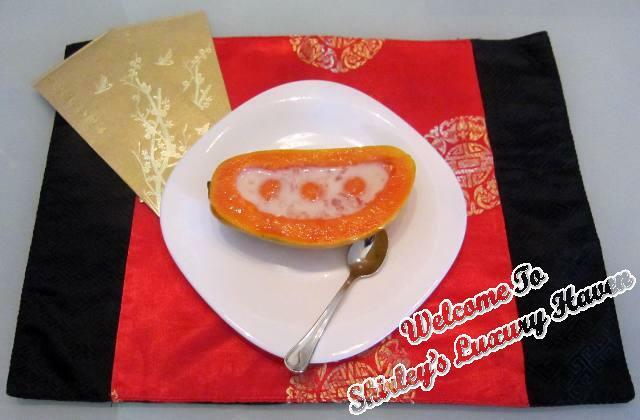 The Golden Bird’s Nest in Hawaiian Papaya wraps up my last course for my Chinese New Year Reunion Dinner. While we're indulging in good food and wine, let's take a moment to pray for the victims of the Japan disaster. I've many friends there and I just can't help but feel devastated. Now is another time to stand together as one people and please pray for Japan! Soak nest in water for about 3hrs. Remove any impurities with tweezers and rinse under running tap. Double-boil for about 2 hours, then add rock sugar. When cool, add almond milk and stir well. Refrigerate for about an hour. Just before serving, cut Papaya into half. Remove seeds and rinse well. Using a melon scoop, dig out some melon balls and make a well big enough for the nest. Pour the bird's nest into the papayas and serve your royal desserts chilled! Shirley, I can definitely tell you've been eating bird's nest since young! You have beautiful complexion and are still maintaining your youthfulness very well. Thank you for sharing this luxurious dish with us and all your other CNY dishes. Beautiful presentation. great recipe for a lovely and glowing skin, esp with papaya. What happened in Japan is devastating. Japan is in my prayers. Woo, yummy! I never like papaya, but this is really good. Will definitely pray for Japan. What a lovely recipe. I was craving for papaya the other day but couldn't find any decent one. I eat it with condensed milk. It is so decadent to eat it with bird's nest! My mom-in-law used to buy that for my children. We double boil and strain it, then add the liquid to their milk. what a great idea! I love papaya! 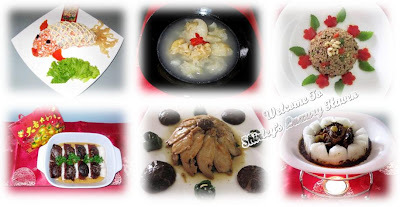 This dish matched so well with your blog name, a real luxury haven indeed to enjoy bird nest soup. I missed it. We can't find bird nest over in here, banned here coz not eco friendly. Lequan, u're too generous with your comments & it's making my head big. Hahaha! But seriously, I do think it works. Rosidah, good to see u again! Thks, my friend! Cakewhiz, it's not the nest but the saliva that are edible & highly prized. It's really tasty! Nava, works better than skincare products. Hahaha! Doris, u the only lucky one here that has tried my Bird's Nest in Papaya. LOL! Will cook for u again next time. Adora's Box, that's another creative way of drinking it. Great to start young! 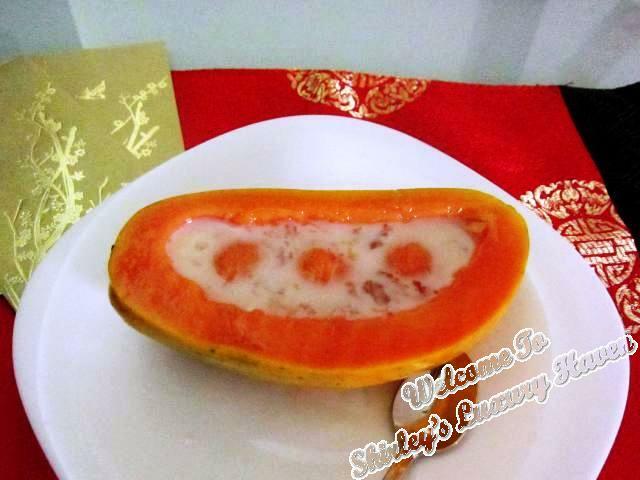 Simply Life, I don't fancy papaya alone, but it taste great together with Bird's Nest. Hahaha! Yin, I've only heard of Shark's Fin being "controlled" but not Bird's Nest. I'm surprised. Well, u can have them when u visit Asia next time. Denise, I agree it's expensive for regular consumption but u can have it on special days. Cut down on skincare & cosmetics & replace with Bird's Nest. Heehee! hello! im sorry if i sound rude, but if you are married for 20 years, then how old are you now? you look 29 or in the early 30, like 31 or 32. does consuming bird nest really work? how long have you been consuming? and how regularly? when is the best time to eat? how is your skincare regime. thanks so much for your advice, i'm trying to look young! Thks to my mum, I started Bird's Nest when I was very young. I took a lot during my flying days cause the air is very dry on board. I also ate them on a weekly basis during pregnancy. How often to eat really depends on your pocket. Hahaha! If your wallet permits, weekly is best. I take it once a mth. I also take Evening Primrose as my skin is quite dry & started going facial once I hit 40. All I can say is, I think Bird's Nest works for me. Hope I've answered your questions. 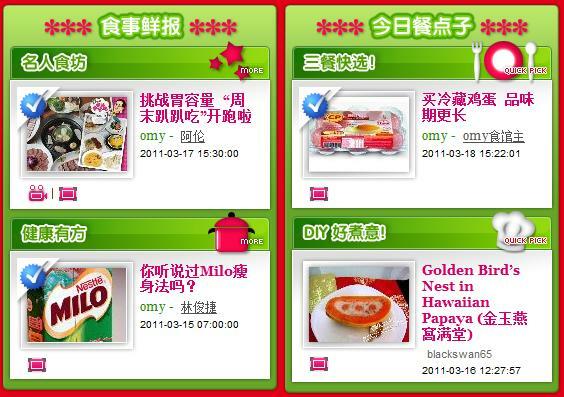 thanks for answering my questions (: when is the best time to eat your bird nest anyway? In the morning when you wake up, or at night before you sleep? or 11-1am? Angeline, I've been advised the best time to eat is before u go to bed, which is also known as the "golden hours". U'll need to take regularly & it takes at least 3 mths to see its effect. U can visit Eu Yan Sang website for the benefits of Chinese Herbs. Ken, maybe I'll try that when I visit Penang :) I love coconut milk too, but maybe almond more ex. Hahaha!